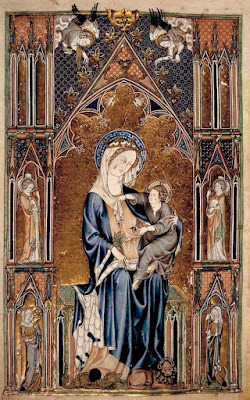 If you want to see some of the best Christian art ever created (in my humble opinion) then do a search on google images for “Gothic psalters” or “medieval illumination”. By digging around from those starting points, you can see wonderful examples of Western and Eastern Christian sacred illumination. Unlike, most larger paintings, the pages have not been displayed for centuries in the light, and their colors remain fresh, their design sharp and clean. 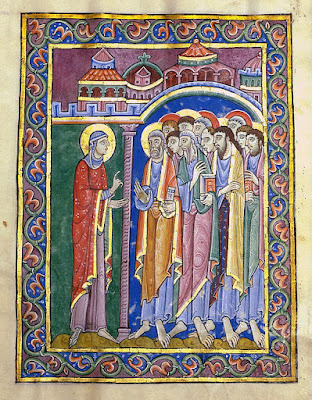 Here is one in the Romanesque style, the St Albans Psalter, with St Mary Magdalene announcing the Risen Christ. Note the beautifully ornate patterned border! 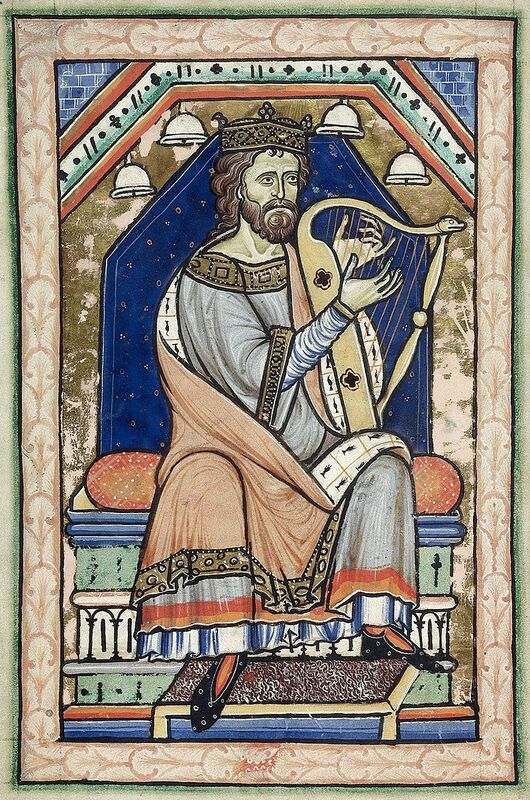 And another in the Gothic style from the De Lisle Psalter. Whenever I see examples such as these, which are part of a tradition of beautiful work that was produced over centuries, I cannot keep myself from wondering why we don’t see artists producing work with these religious qualities today, or at least not very often. Then I ask myself, how can we help artists to emerge in the 21st century who can do the equivalent of this art, which has a balance of idealism and naturalism, and which encourages prayer? I had to consider just this question recently when I was involved in the creation of an online class about the psalms “The Psalms in Words, Images and Prayer.” I contributed to the “images” part of the course. First, I considered the principles by which sacred art has been used to illuminate the psalms in the past; then I discussed how we might move forward from where we are now, in order to create art that will encourage the praying of the psalms. This article will be in two parts. Today I will offer a summary of the past principles. 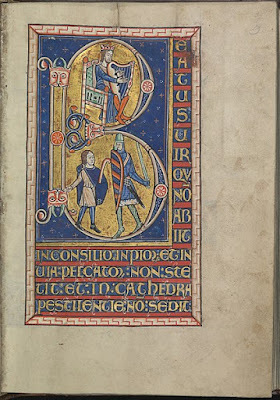 Next week, I will discuss where we go from here: in this age of Universalis and iBreviary, for example, should we try to re-establish the traditional psalter by commissioning the creation of a “retro” Psalter, rather like the St John’s Bible project? Or should we create a distinct and new 21st-century approach? Themes relating to the Psalms in general, e.g. salvation history, or the mysteries of the Faith. St Thomas tells us that the Book of Psalms is at the heart of Scripture because it contains “all of theology”, encapsulating poetically the historical events that occurred before they were written and pointing to those that occurred afterward. It is no surprise that in order to illuminate this, artists chose a schema that included themes relating to salvation history. Interpreting this broadly this allows for any of the images we might appropriately in a church or icon corner connected to the liturgy. These would typically be placed in the Psalter before the text of the psalms themselves, and the common themes might be the Fall, the Baptism of the Lord, the Crucifixion, the Risen Christ, and then depictions of David as the author of the book of Psalms. There might be also depictions of the genealogy of Christ, with the main line running from Jesse through Our Lady to Him, with the intermediary descendants represented on the branches, as in this image from the Lambeth Psalter. 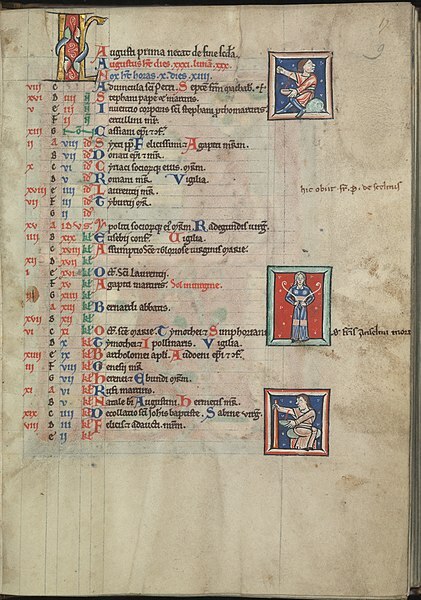 These are in the first section of the Psalter, and as the name suggests, would be a single page devoted to a month and listing the feasts. Illuminations would be the sign of the zodiac for that month and common nonliturgical activities - labors of the month - associated with it, such as planting or harvesting crops. Here is August, complete with a depiction of Virgo, from the Psalter of Eleanor of Aquitaine. 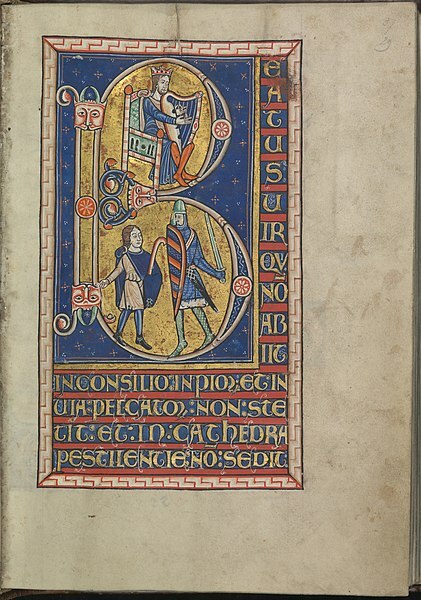 Historiated initials ornate combinations of lettering and art for the first letter of the psalm. These would not typically be done for all the psalms but were elaborate ways to mark designated points in the Psalter. These bookmarks were needed as reference points because although the psalms might be numbered, the pages were not. 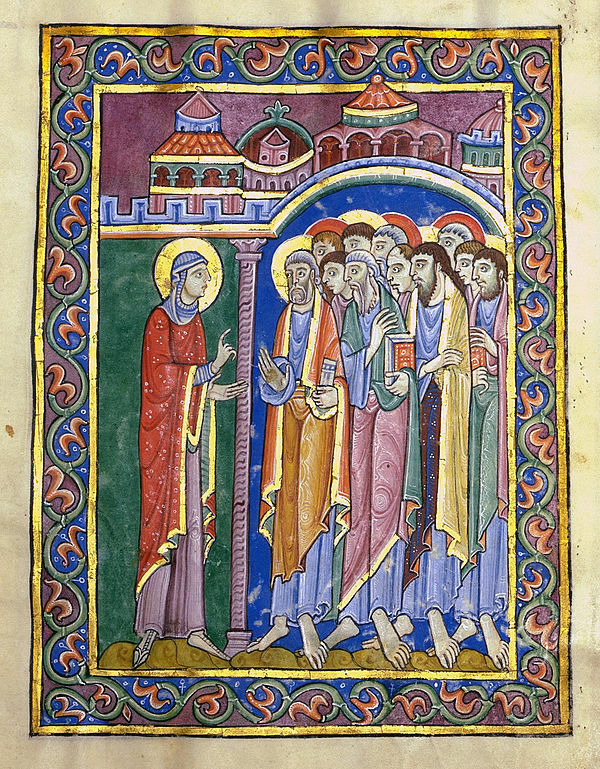 Typically the psalter would be divided up into 10 sections. 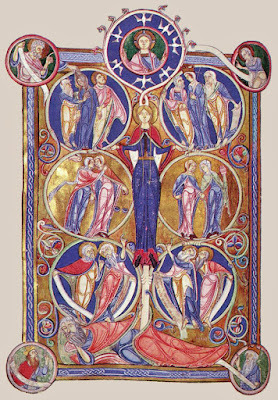 Here is the first Psalm, Beatus vir, (Blessed is the man), from the Psalter of Eleanor of Aquitaine. The purpose of these was also to mark the beginning of each Office, so that you could find it more easily in a book that contained no index or page numbers. These might be general themes of salvation history or the psalms, or a series that presents a narrative theme. For example, in the Little Office of the Blessed Virgin Mary, the major episodes of her life are very often depicted at the start of eah Hour. Here is the beginning for Matins, showing the Annunciation, from the Belles Heures of Jean of France, Duke of Berry, a French manuscript of the 15th century. Through the Psalter, the artist might add illustrative details. Sometimes one gets the impression that this iwas done to fill a gap in the text, so that there wouldn’t be a lot of empty space on the page. Here is Moses as an incidental illustration for one of the traditional Canticles of the Divine Office, Deuteronomy 32, 1-43. The horns, incidentally, derive from a famous mistranslation by St Jerome in the Vulgate, and ought to be rays of the reflected light of God shining from him.